The defense chiefs of South Korea and the United States will hold talks in Washington early next month over the security situation on the peninsula and joint peace efforts, Seoul's defense ministry said Monday. The talks between, Defense Minister Jeong Kyeong-doo and acting US Secretary of Defense Patrick Shanahan, are likely to touch on such pending issues as the allies' combined military exercises later this year and the envisioned transfer of wartime operational control. 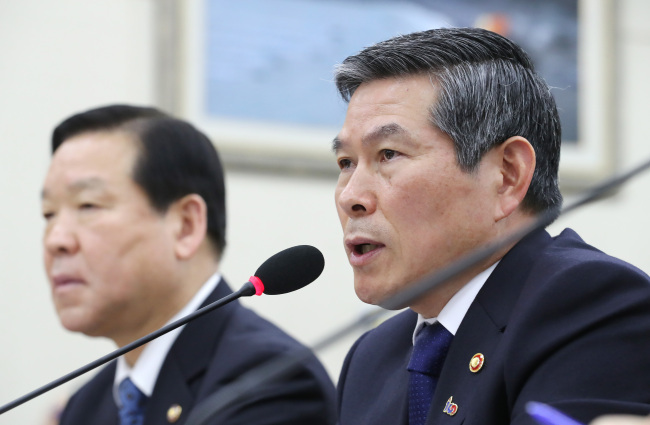 "(The ministry) will continue to strengthen the South Korea-US alliance, which is the foundation for our efforts for the denuclearization of the Korean Peninsula and the establishment of peace," the ministry said during a policy briefing to the National Assembly's defense committee. They are also likely to discuss the allies' plan to verify Seoul's initial operational capability required for the OPCON transition. The IOC certification process is set to occur during their combined command post exercise slated for August. The allies are pushing for the "conditions-based" OPCON transfer after which the South will lead wartime operations with the US playing a supporting role. Ahead of the ministerial talks, South Korea's Army Chief of Staff, Gen. Kim Yong-woo, plans to visit China this month. In April, Seoul will also hold a ceremony repatriating the remains of Chinese troops killed during the 1950-53 Korean War. Seoul also appears poised to enhance defense ties with Tokyo after they were embroiled in a military spat triggered by Japan's claim that a South Korean warship locked fire-control radar on its maritime patrol aircraft.